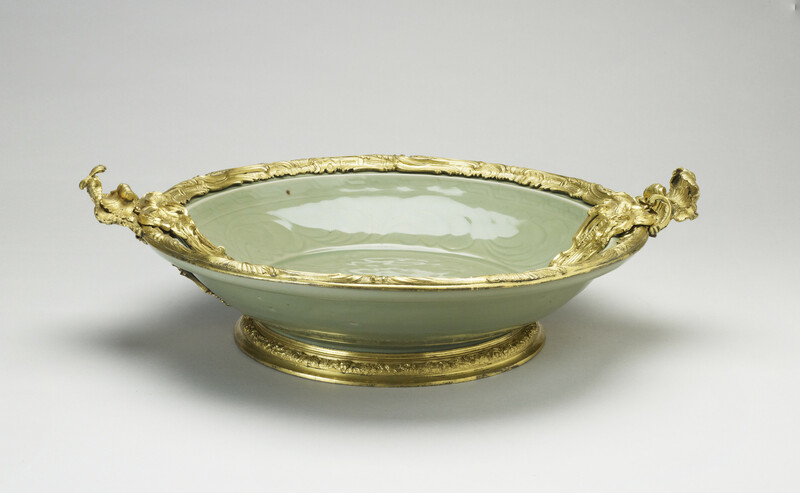 Chinese porcellanous stoneware dish, with carved decoration under a thick grey-green celadon glaze and French gilt-bronze mounts. Thickly potted, with narrow, spreading rim. Carved in the centre is a flower spray and round the sides a scrolling design, with a border of sloping key-fret pattern. Attached to the base is a ring of gilt bronze, cast with flowers, from which a pair of pierced rockwork straps extends upwards on either side to the rim, attached with pin and barrel hinge clasps. The rim is encased in a richly ornate band of scrolling foliage, rockwork and panelled cartouches. 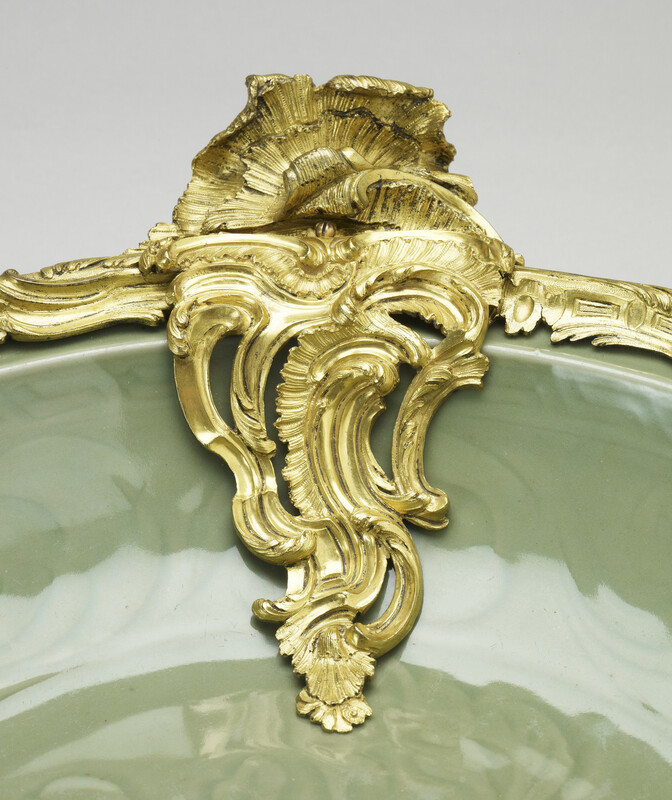 On opposing sides is a pair of asymmetrical, pierced S-scroll and rockwork clasps, which spill into the centre of the bowl, tapering in a foliate spray. The handles are formed of highly stylised C-scrolls and rockwork, perhaps suggesting shells. The mounts reflect the lively naturalistic and asymmetric style which prevailed in France during the second quarter of the eighteenth century. 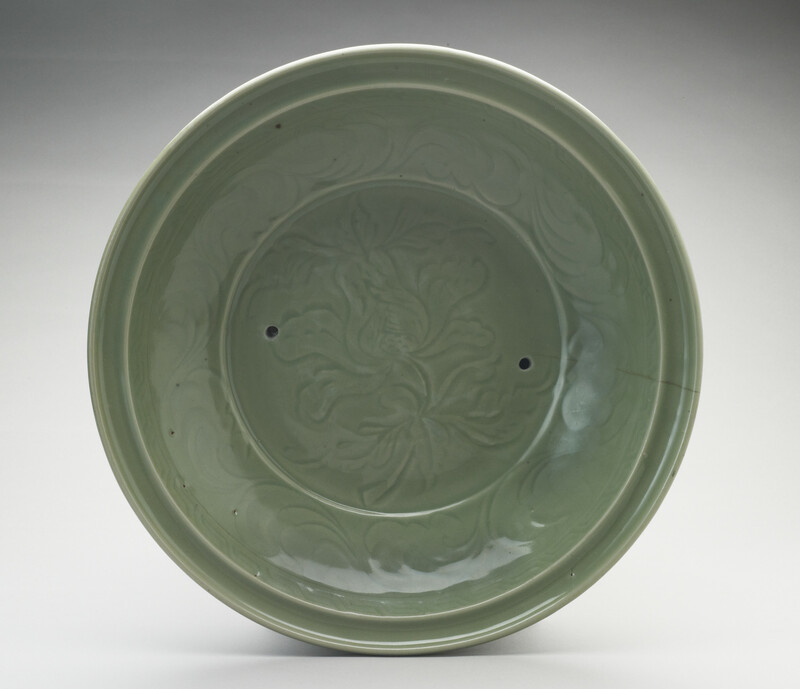 Those on the rim and sides of the dish are of exceptionally high quality. Unusually, the mounts are set as if tumbling from the edge into the centre of the bowl - presumably to conceal the cracks beneath them on each side. Almost certainly bought by George IV before 1812.